They participated in a fun demonstration of communication barriers and techniques to bridge distances and cultures. What happens in Vegas doesn’t always have to stay there. Dazzling city lights, elaborate music and theater shows and gourmet restaurants from the best chef’s in the world all come together to create the vibe of Las Vegas. With luxury resorts lining Las Vegas Boulevard and the sound of slot machines chirping away, the city is stimulating and invigorating for any team building or corporate retreat. 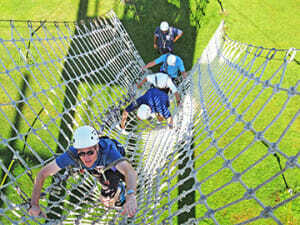 Try Jumpstart to add extra energy to your next team building event in Las Vegas! This abbreviated version of our popular Pursuit program taps into the skills and talents of every team member as participants collaborate and compete in a series of mental and physical activities ranging from elaborate problem-solving exercises to light-hearted contests. Teams are given instructions and a limited time to determine how to acquire the greatest number of points for completing each challenge. Have fun in the sun; learn about your co-workers all the while sharing leadership, strengthening communication skills and innovative thinking. Jumpstart at your Las Vegas resort offers a memorable and robust team building experience, even if you have limited time. Our GeoTrek event blends adventure and technology into a treasure hunt along The Strip that includes GPS units, maps, clues and “on-the-go” challenges. Each team develops its own strategy and adventure in this friendly competition. Delve deeper into a meaningful experience with your team and incorporate our Planning for Transition workshop into your corporate retreat. Our programs can be held in your conference room in resorts such as New York New York or The Wynn.